"READY TO RACE" – for KTM, these three words are far more than a simple slogan. They stand for the entire company philosophy of developing vehicles that can without any modifications comprehensively assert themselves in any race. Direct from the dealer onto the track and into the battle for victory. Designers, engineers and riders are bound by a clear common denominator: an unconditional passion for motorcycles. The whole KTM family is a living example of this worldwide. Countless offroad World and European championship titles plus brilliant victories in the world's toughest races (International Six Days Enduro, Dakar Rally, Erzbergrodeo, and many more) all speak for themselves. And KTM Supermotos, Naked Bikes, Superbikes and the X-Bow all demonstrate what an "orange" lead means on asphalt. 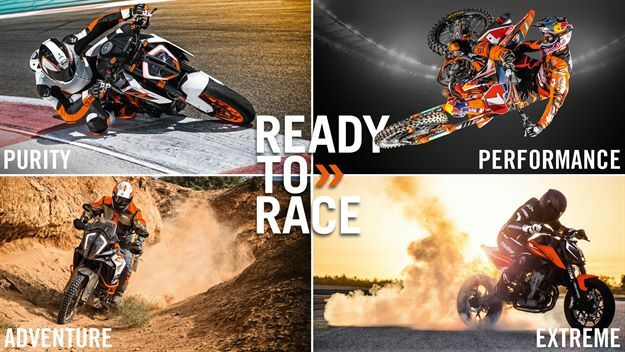 KTM’s pure racing focus is reflected in the PURITY of design and uncompromising function - as each KTM is built for the single purpose of performance, so it is reduced to the limit and free of unnecessary weight, gadgets or gimmicks. PERFORMANCE is the cornerstone of KTM’s READY TO RACE brand positioning – without exceptional PERFORMANCE, victory is not an option. Every new ride on your KTM is an ADVENTURE waiting to be experienced – a dream that is yours to go and realize. KTM’s commitment to living life to the EXTREME and building motorcycles with EXTREME performance guarantees that every KTM ignites emotions and delivers thrills. "READY TO RACE" will continue to be the philosophy of KTM in the future too – in the development and production as well as the use of its vehicles.